A large part of the increase in private school enrolments has been due to a strong increase in the primary school years (see chart below). 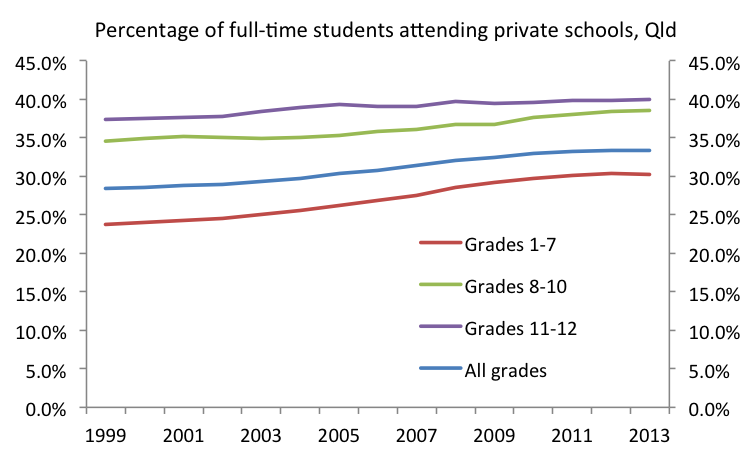 In the last couple of years, however, enrolments appear to have plateaued across all grades, possibly because of recent cost increases or because all the households which can afford to pay private school fees (and aren’t philosophically opposed to private schools) are now sending their children to private schools. That said, it’s possible that if the economy does perform strongly over the next few years the trend towards greater private school enrolments could resume. This entry was posted in Education and tagged education, qld, queensland, schools. Bookmark the permalink. Do you think that this growth, and it’s subsequent slowing, has anything to do with state trends of inter-state migration? Could the growth have been led by a cashed-up migration from the southern states? Yes, I think it has probably played a part. We can’t tell how much of a part with the data that’s available, though. Growth in primary school – some of the growth will be in the Year 7 now being part of high school, and no longer primary school. Children traditionally attended the closest state primary, and a more distant private high school. Grade 7 to 12 is now high-shool, so children move to private school 1 year earlier, and stay for 1 year longer, which may account for the increase private in your graph Grade 1 – 7 , as there will be many more private year 7 students than previous years. Also, many private schools have been aggressively redeveloping and rebuilding and advertising to attract children from prep to Grade 12. No doubt driven, by some government subsidy somewhere. The above graph wouldn’t show year Year 7 into secondary, as this transition won’t occur until 2015 in Queensland. There are some secondary schools already piloting Year 7, but not a huge number. It will be interesting, however, to monitor for an impact of the transition across the coming years. Thanks for that info, Jaree.